In this utterly compelling novel, two sisters born into privilege find themselves forced to make wrenching life decisions as they struggle with a troubled family legacy and the immense weight of wealth, fame, ambition, and betrayal. Misfortune’s Daughters chronicles the gripping, multigenerational saga of the wealthy Stephanopolis family. Beginning in the Golden Era of Hollywood, the beautiful and talented actress Laura Marlowe meets the young, dashing, and rich shipping magnate Nicholas Stephanopolis. After a whirlwind courtship, the two marry and move to the private Stephanopolis Island in the south of Greece. Yet heartache and tragedy soon find them and extend into the lives of their two very different but willful and ambitious daughters, Venetia and Atlanta. One is a beautiful and favored daughter who’s bent on self-destruction; the other is a wallflower who buries herself in books and shies away from her privileged world. But both must confront the legacy and tragedy of the lives of their parents. 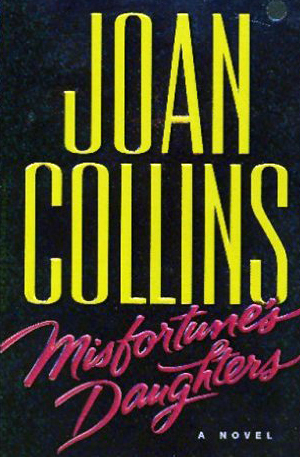 Sweeping across almost 60 years and jetting from New York to Paris, Los Angeles, and Greece, Misfortune’s Daughters is an irresistible, page-turning tale that reveals the glittering life of show business and the grittiness of the journalistic profession. Drawing on her own knowledge and experience, Collins takes the reader deep inside the exclusive gates of wealth and luxury, exposing dark secrets and forbidden desires as two young women vie to break free from their family’s shadow and become independent women in their own right.